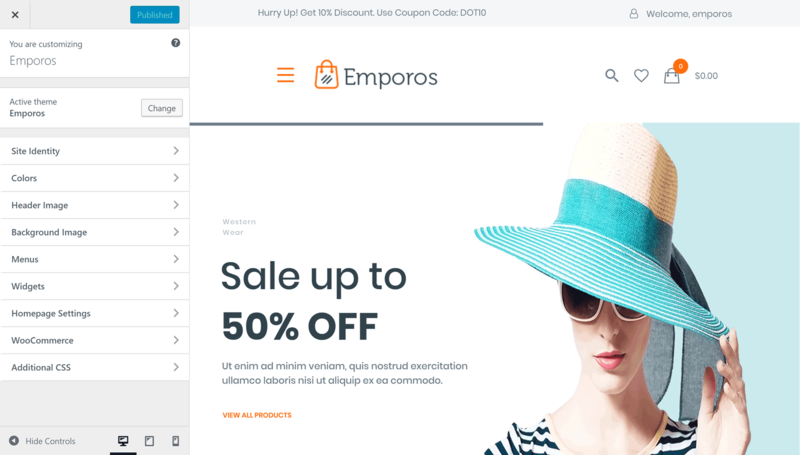 Emporos is a brand new WordPress theme for creating great looking ecommerce stores. This theme has a range of pre-built website demos that are focused on selling particular types of products. However, as it’s a flexible theme, it can easily be adjusted to suit even more types of stores. 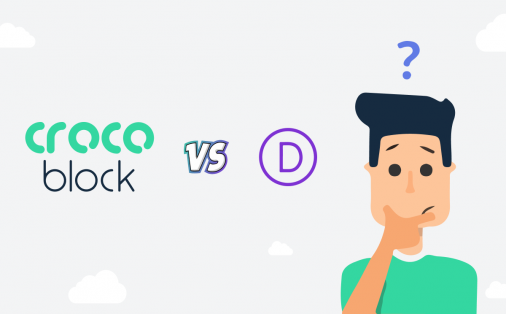 In this hands-on Emporos WooCommerce theme review, we’ll explore the best features to help you decide if it’s the right choice for your online store. 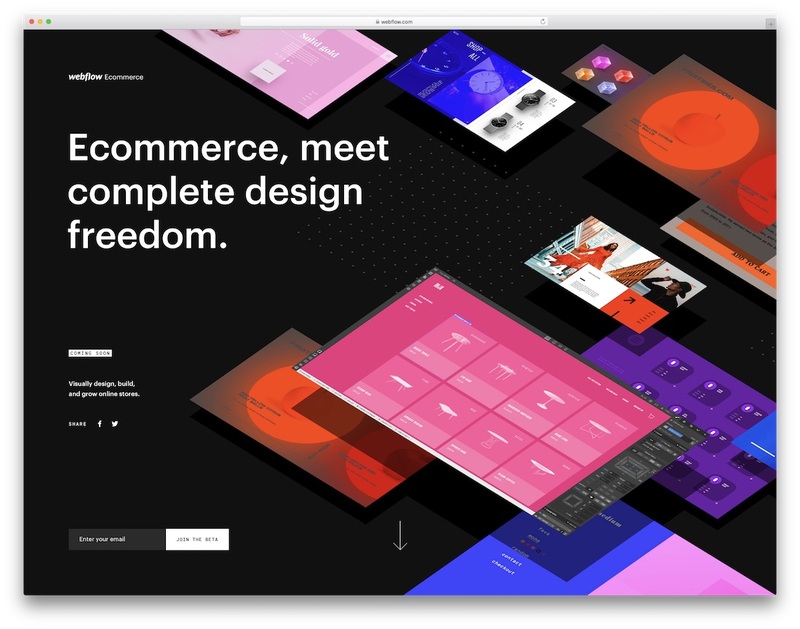 So let’s start our review by looking at the pre-built ecommerce store demos included in the Emporos WordPress theme package. 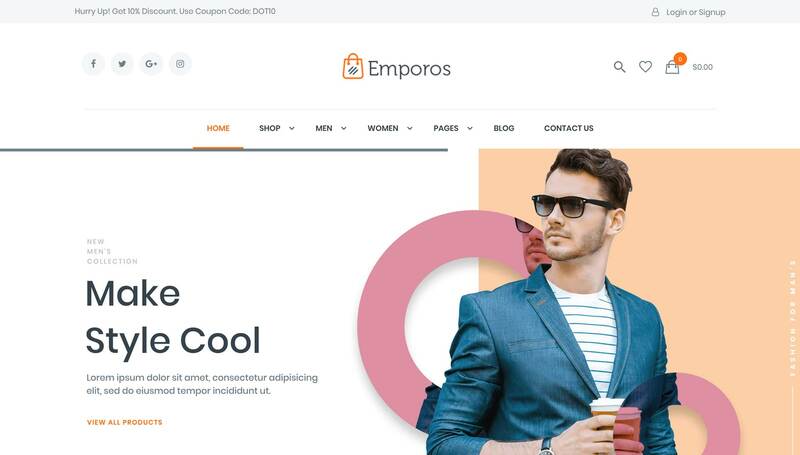 As Emporos is first and foremost an ecommerce theme, its close integration with the WooCommerce store builder plugin is its most important feature. However, this theme has a lot more going for it than just that. 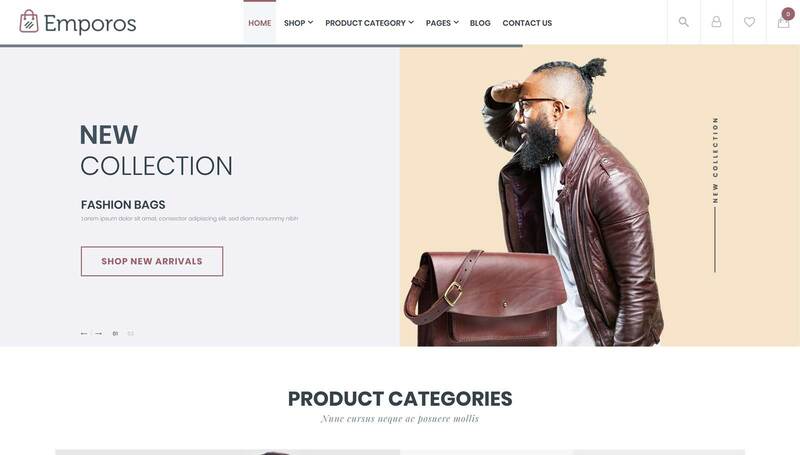 In this section of our Emporos WooCommerce theme review, we’ll explore those features in more depth to help you decide if this is the right option for your online shop. If you want to create a successful ecommerce store then it’s vital that your website has a high-quality design. Of course, your products and inventory matter. But if your site doesn’t have a suitably professional look, it will be hard to convince your visitors to enter their payment details. Therefore, ensuring your store looks reputable will make it easier for your visitors to trust your website. Thankfully, Emporos comes equipped with not one, but multiple pre-built online store demos. It’s fair to say that each website design has been finished to a high standard. So let’s explore them now to help you get a sense of how your store could look if you choose this theme. 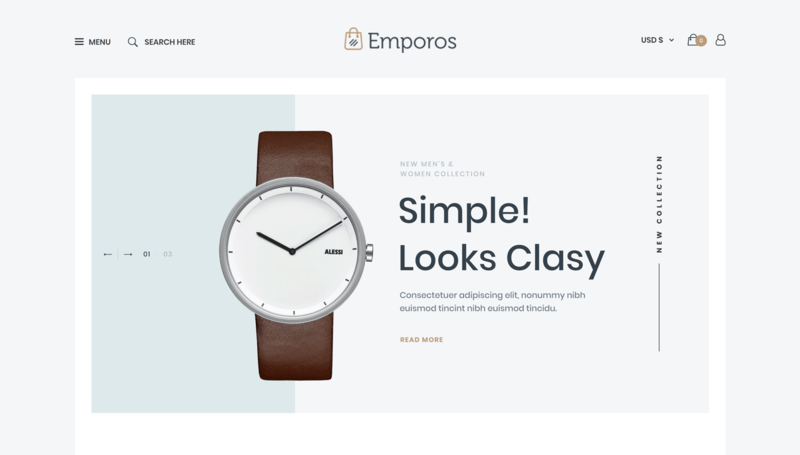 With a large product slider on the homepage, the Emporos fashion demo has a great design that will help you promote your inventory in style. The promo bar that’s displayed right at the top of your website is ideal for sharing any news or offers with your audience. If you’re using the discount coupon functionality of the WooCommerce plugin then the header bar gives you an easy way to display those codes to your shoppers. After the main homepage product slider section, you have the opportunity to share some key details about your store. Next up you can display the product categories at your store, complete with an eye-catching image and call-to-action buttons. The rest of the default homepage fashion store demo layout is packed with useful elements. Therefore, if you’re store is in any way fashion related, be sure to check out this demo. If you’re creating an online watch store then you’re in luck as Emporos has a stylish purpose-built watch shop demo. The homepage of this demo features a large product presentation that’s perfect for highlighting your best watches and other items. 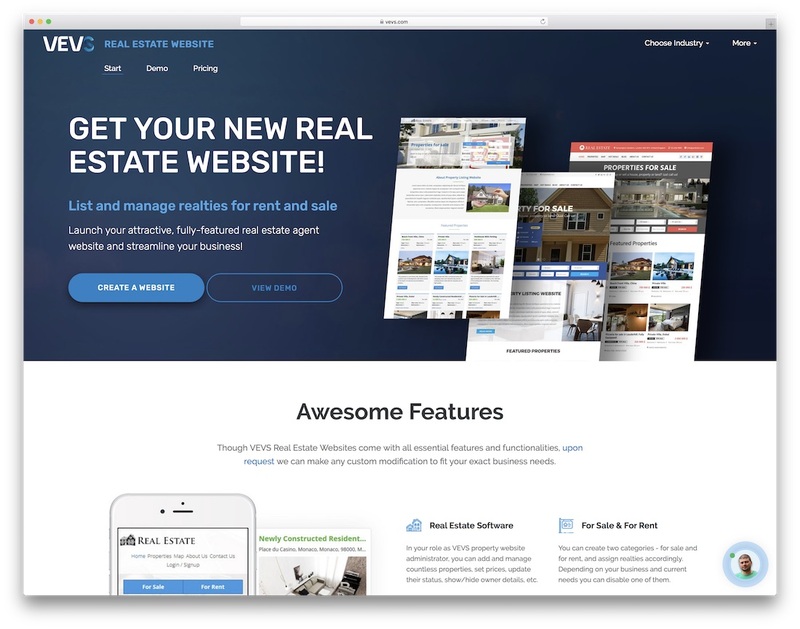 The animation effects used on the rest of the homepage modules should help grab the attention of your visitors as they scroll down the page. When it comes to the type of elements you can use on your store homepage, you’re not short of options. A brand logo section, sale and product promotion information, and featured products can all be displayed through the default layout. Finally, you can display an email optin form in the footer to encourage your visitors to join your mailing list. 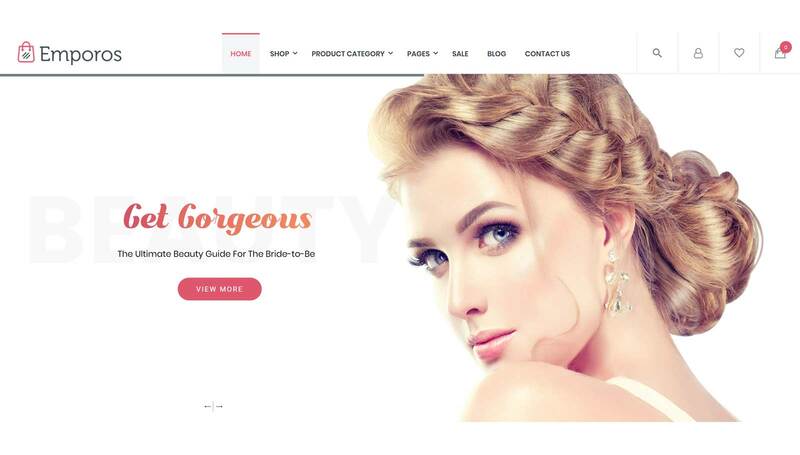 As the name suggests, this demo will help you launch an online cosmetics store with WordPress. Simply import the content for this demo, and you can check the hardest part of creating a professional looking online store off your list. The clean design and neutral colors really make your product photographs stand out on the page with this demo. 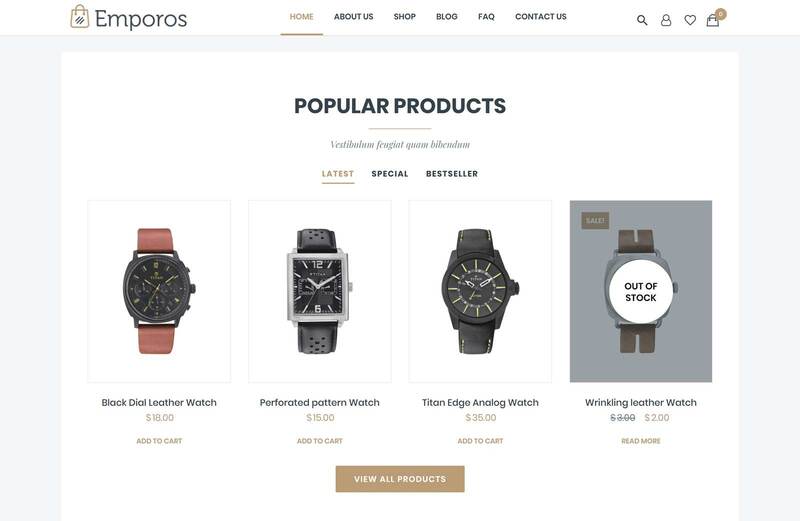 As you’re probably starting to expect from the Emporos online store demos, this option includes a feature-rich homepage layout. Sliders, product promotion countdown timers, and animation effects help to ensure the front-page of your store has strong visual appeal. If you want to stand out in a crowded market, this option, like the other Emporos demos, will help you achieve your goals. Handbags, purses, clutches, and even luggage can all be promoted through the Emporos online bag store demo. Like the other demos from Emporos, this design can easily be adjusted to suit other products. However, if you are creating a store selling stylish bags, then you’re in luck with this demo. Thanks to the large homepage slider, you can easily put your best products right in front of your target audience. Another useful aspect of this demo that’s sure to come in handy is the trending products widget. With this section on your homepage, you’ll be able to easily let your visitors find your current best sellers. The sale banner could be put to good use on your website too if you ever run promotions such as product discounts and clearances. Those using content marketing to promote their online store should appreciate the blog post excerpts section as well. The Emporos furniture store demo has a sleek and modern look that’s ideal for fashionable homeware. Sellers of high end or bespoke items should find the best use for this ecommerce furniture demo. Unfortunately, due to its design, those selling large volumes of cheap flat pack furniture might want to look elsewhere. 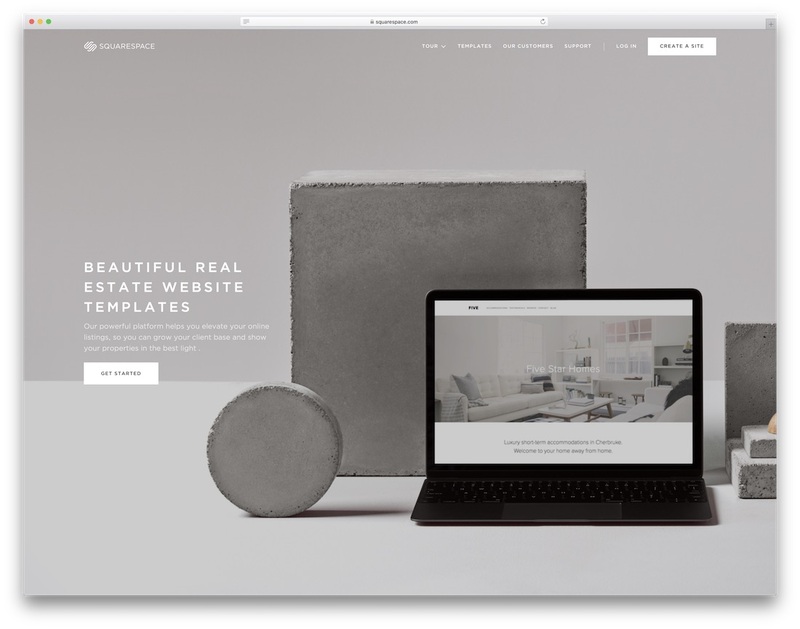 However, if you do need a website with a stylish look that matches your products, this demo is a good choice. 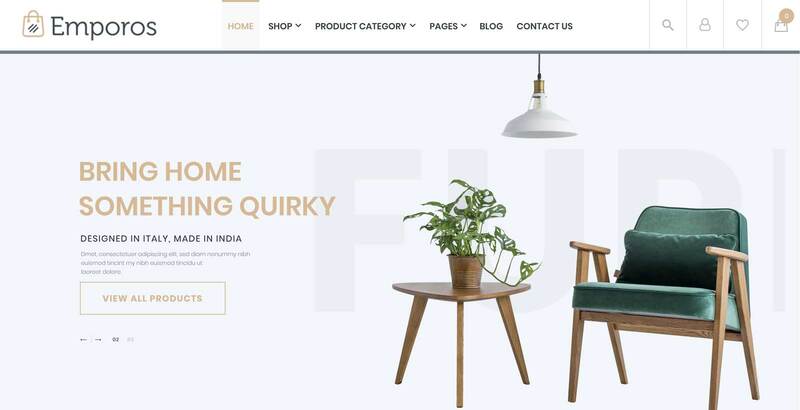 Like the other Emporos WooCommerce store demos, your homepage design can be packed with useful elements to help you sell more items and connect with your audience. And like the other designs, you can easily pick and choose which of these available elements you want to use. All this should help you create the right type of online store for your business, with the best chance of success. More demos are on the way so be sure to check the Emporos promotional page for the latest website designs. 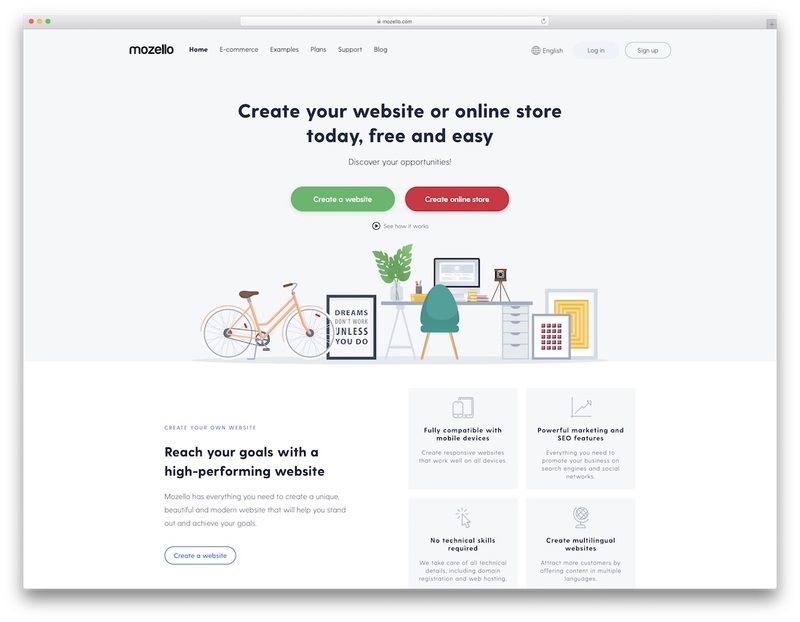 Having access to a great selection of ecommerce store demos doesn’t mean much if you can’t easily apply them to your website. Thankfully Emporos avoids this problem. By including an easy-to-use demo content importer tool, you can quickly install the demos on your website. With the controls located inside your WordPress dashboard, you can preview the different options without leaving your site. Then once you’ve made a decision, simply click the import button to get started. In just a few clicks you’ll have transformed your WordPress website into a stylish ecommerce store. 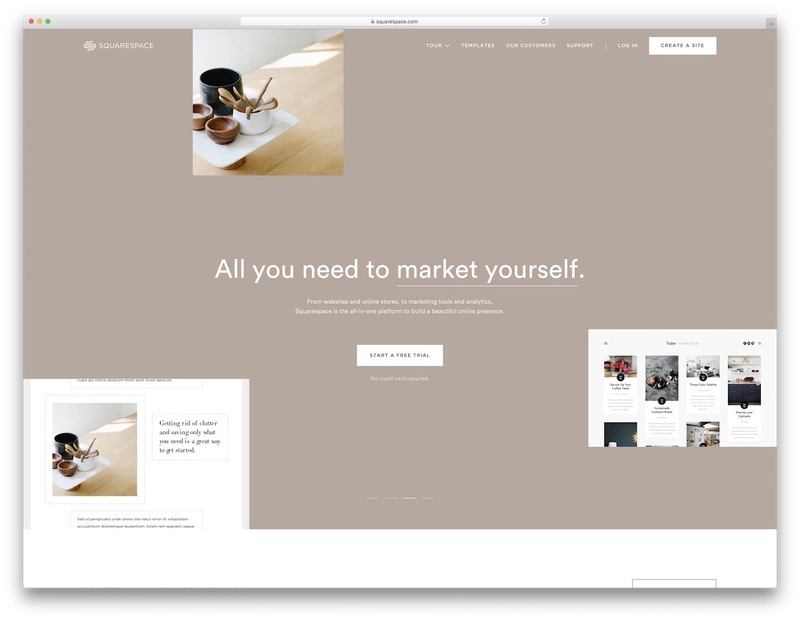 Although the Emporos online store demos are impressive, they might not be 100% perfect for your website. If that’s the case, don’t worry. 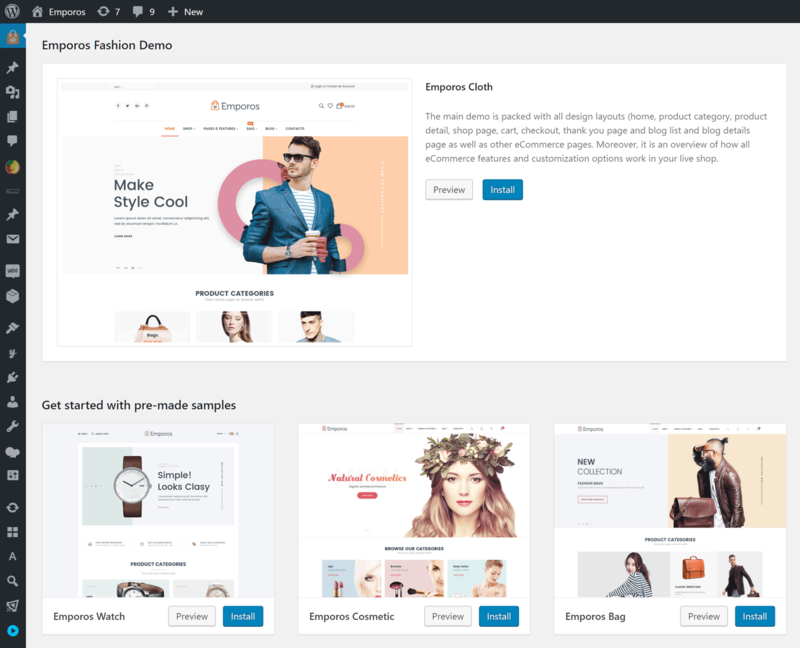 The Emporos WooCommerce theme package includes one of the most popular drag-and-drop page builder plugins. Thanks to this, you can launch the Visual Composer AKA WPBakery Page Builder plugin and start editing the demo content. The page builder user interface is very intuitive. 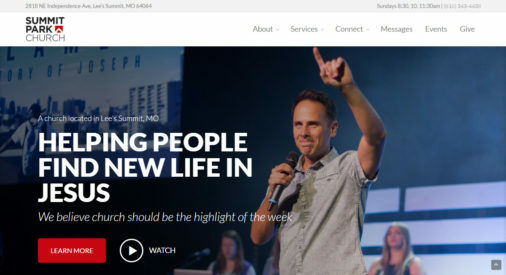 So no matter how much web design experience you have, or even if you have none at all, you shouldn’t find it difficult to adjust the demo content. 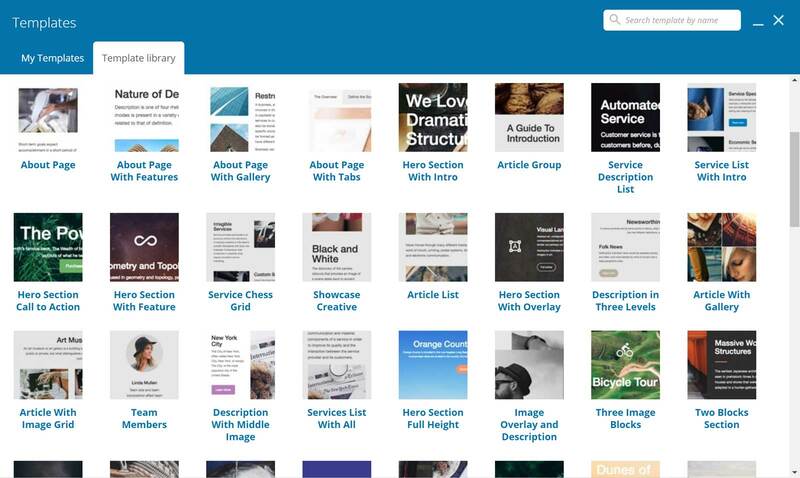 You can even use the page builder to create your own custom content designs from scratch, ensuring you can add more pages to your site as needed. 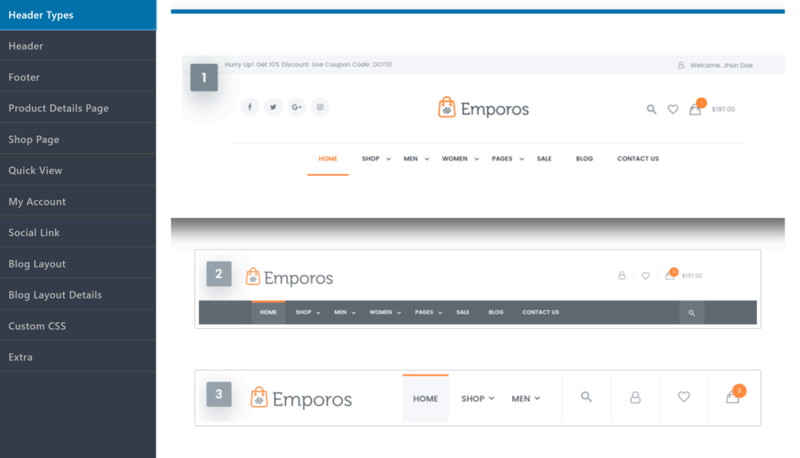 As well as enabling you to customize the Emporos demo content, you can also use the page templates and sections included in the page builder tool. Thanks to this feature, you can quickly add new pages to your store, including the pre-built page sections in the builder library. The front-end editor of the page builder is great for seeing how your content is progressing in real time. However, the tool also has a useful back-end editor that’s good for quickly moving elements around and creating a basic layout for your content. 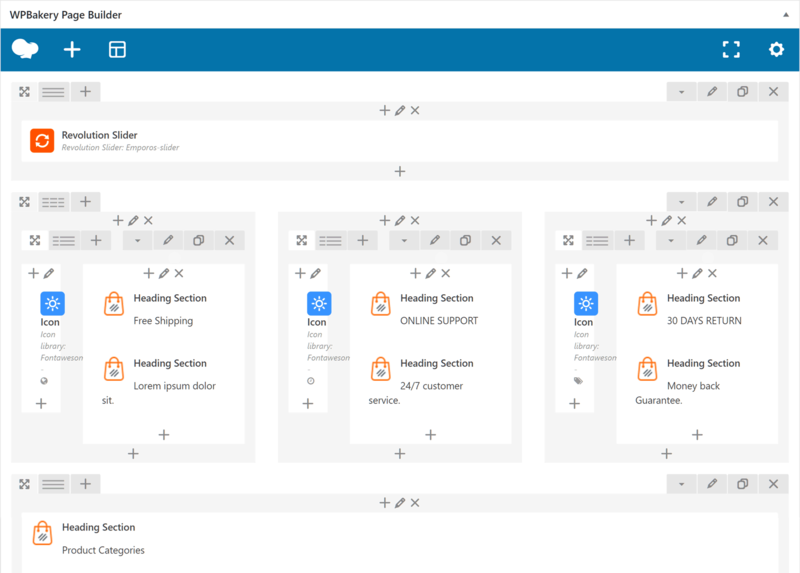 Whether you want to create your own custom content, redesign the demo content, or simply make a few cosmetic changes to the pages of your store, the drag-and-drop page builder makes it possible. As well as drag-and-drop page builder tool, Emporos can be customized in a number of other ways. One option is to use the WordPress Customizer interface to personalize this theme and your website. Although the Customizer is a great feature of WordPress, not every theme uses it. Thankfully, Emporos makes good use of the Customizer, giving you access to a wide range of options through this intuitive interface. Thanks to the way the Customizer works, you can see what effect your changes are having as you make them. This helps speed up the customization process, saving you time and effort when personalizing your site. As well as the Customizer, you can also configure the theme from the options panel in your WordPress dashboard. 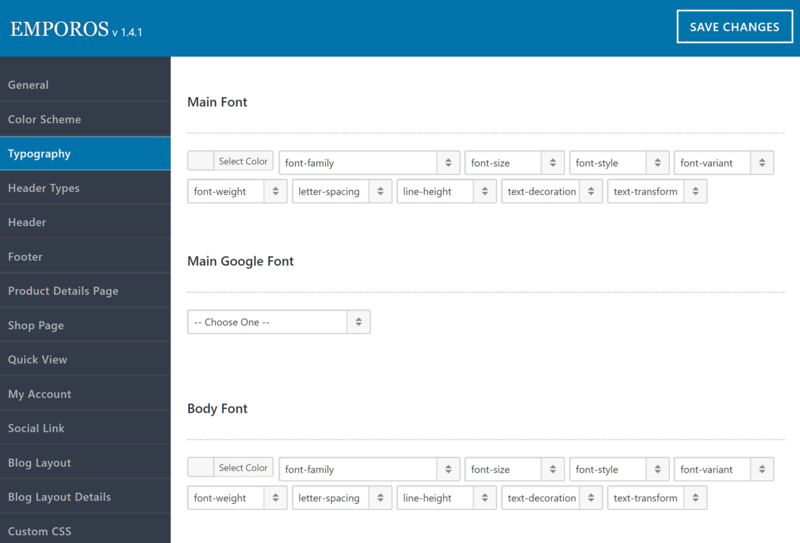 Through this control panel, you can easily change the fonts for each typography style on your website. Adjusting the colors is easy too. 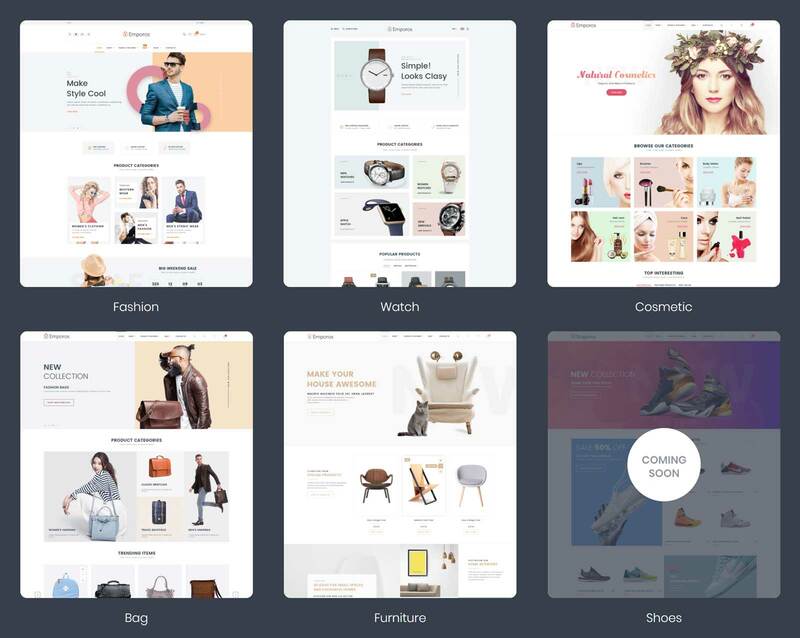 There are also five different header layouts that can be instantly applied to your store, regardless of which demo you’re using. The theme options also give you a good amount of control over what product information is displayed on your site. Through the checkbox settings, you can quickly show or hide information like the product SKU, related products, and product image light boxes. The above covers the main features of this theme. However, the next section of our Emporos WooCommerce theme review will include a quick rundown of the other important features it includes. One of these features if the powerful Slider Revolution plugin. If you’ve already checked out any of the Emporos demos, you’ll have noticed they include some impressive slideshows. Well, these design elements as powered by the premium Slider Revolution plugin. And with access to this tool, you’ll be able to customize these sliders and even create advanced slideshows for your store. Emporos also includes a few other premium third-party plugins that enhance your website at no extra cost. Many ecommerce elements that can help you sell more products. A fully mobile responsive design. Code optimized for fast loading times. Video tutorials to help you create your ecommerce store with Emporos. Multiple custom footer layouts to choose from. You can view the full list of features on the Emporos WooCommerce theme homepage. 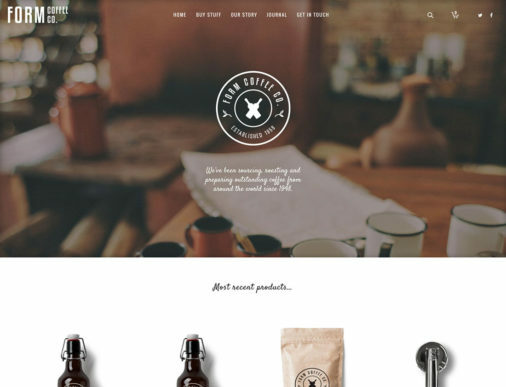 The Emporos WooCommerce WordPress theme has been created by CreataStudio. They also have another website template in their ThemeForest portfolio and have received positive feedback from users of both products. 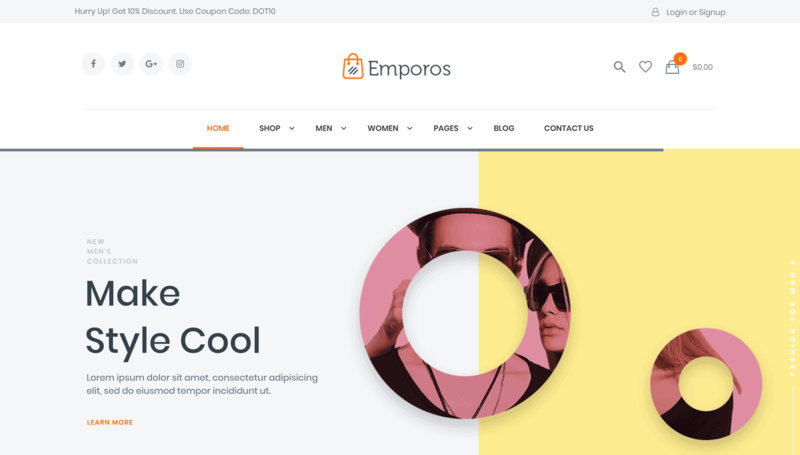 The Emporos WooCommerce theme is available from the ThemeForest marketplace, the most active place to purchase WordPress themes online. For $59 you get access to all the features mentioned above in our Emporos WooCommerce theme review, plus a few extras we didn’t have room to cover. The price includes access to over $100 worth of premium WordPress plugins. These aren’t just tools that have been added to inflate the Emporos feature list. Plugins like the WPBakery Page Builder and Slider Revolution are high-quality plugins that genuinely add a lot of value to this theme and your website. For your $59, you also get lifetime access to theme updates, ensuring you’re able to keep your website fully up-to-date. This also means you’ll get automatic access to any new store demos that are released in the future. Each purchase provides you with access to support from the theme developer for six months. However, you can extend this period to 12 months by paying an additional small fee. Something you might want to consider investing in if you’re using this theme for a proper ecommerce business. That about brings our Emporos WooCommerce theme review to a close. 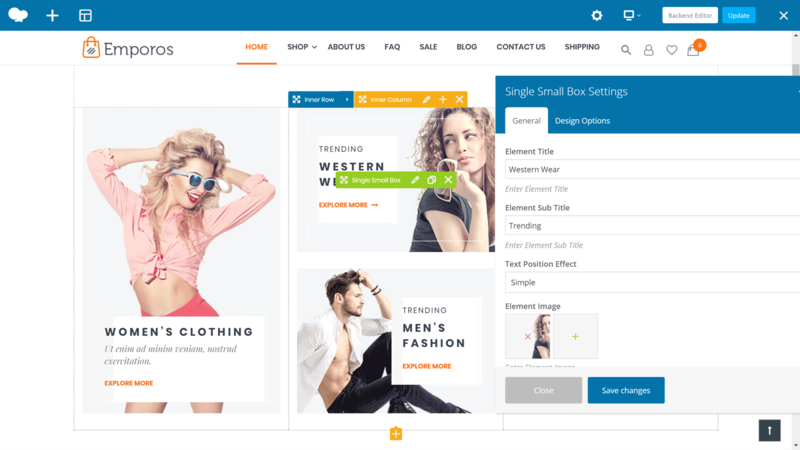 Hopefully, you now have all the information to decide if this is the right ecommerce template for your online store. As you’ve just seen, Emporos combines a set of high-quality website demos with an impressive feature list. So if you like what you see, you should have no trouble creating a professional looking ecommerce store with Emporos, WordPress, and WooCommerce.